Please note: we are very sorry to have to report that this product is now out of stock and no longer available. For other animal themed umbrellas, please click here. Or, see our range of novelty umbrellas – please click here. If you’re looking for a crocodile umbrella, then snap up this fun crocodile design umbrella quick. The Diamante Crocodile Silhouette Umbrella with UV protection is a very unusual and distinctive crocodile umbrella. The moulded ABS plastic handle is in the shape of a crocodile with the additional detail of a beautiful diamante as the crocodile’s eye. 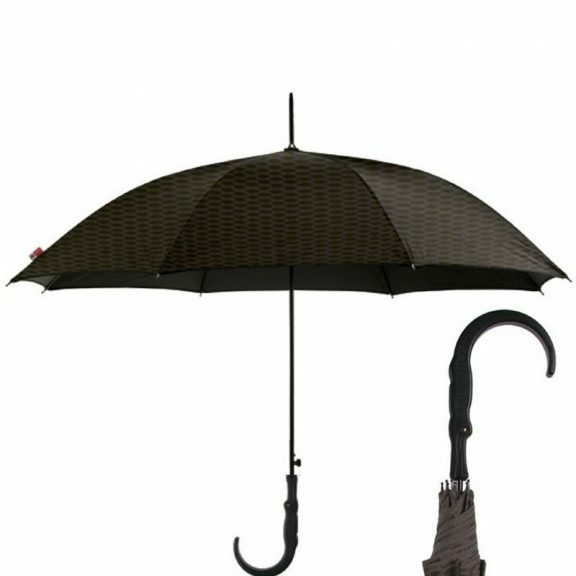 This automatic stick umbrella features a stylish two tone grey patterned canopy, a black steel shaft and fibreglass ribs. With the addition of beautiful diamante detailing on the handle and closure strap this slightly eclectic novelty umbrella is a good quality brolly for the person looking for something just that little bit different.